Viral hepatitis are among the most serious diseases in the world, according to World Health Organization (OMS). This disease globally kills about 1.4 million people each year. (1) The inconceivable is that most of these deaths are preventable with adequate information, early detection and access to highly effective medication, and in the case of hepatitis A and B also can and should be prevented by vaccination. 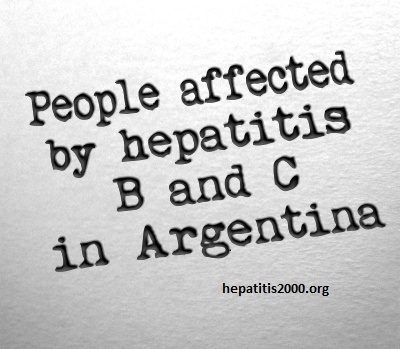 In our country, unfortunately there is still no exact figures on the number of people affected by hepatitis B or hepatitis C but different studies in some regions of the country, the number would range between 5% and 1.5% depending on the region (2), it can be estimated that there could be more than one million Argentines affected by some of these hepatitis. These kind of viral hepatitis are asymptomatic and therefore most people when it comes to diagnosing the viral infection is advanced and very damaging his liver, with consequences such as cirrhosis, liver cancer, or need for transplantation, consequences that often end with the death of the person. In Argentina the highest percentage of people awaiting liver transplantation (1100 people (3) is for consequences of hepatitis C or hepatitis B, usually not detected in time. This question shows a serious problem and multiple difficulties in the Argentinian public and private health system in order to advance in the real control of chronic viral hepatitis. People with chronic hepatitis, organized in self-help groups and NGOs, have worked and analyzed different aspects of this problem and provide our analysis to the various health public agencies (national and provincial) to take into account to redefine the approach action and control of chronic viral hepatitis in Argentina, to improve the quality of life and the opportunity to cure of those who are currently affected by these viruses, preventing death cause these diseases, and prevent the spread of these diseases. Groups, activists and NGOs Argentine people with chronic hepatitis who were called by the HCV Sin Fronteras Foundation – through the initiative of the networking HepaRed Argentina, developed during 2014 workshops related to finding solutions to the problem of people affected by viral hepatitis in Argentina. Of the contributions made by groups, activists and NGO participants has born this document of application actions, where we express our problems, our worries, our orders and claims and our thoughts about the direction it should take the work against these diseases in Argentina. Hepatitis National Law – The priority must be given to the work already started to achieve a Hepatitis National Law ensuring the rights of people affected by Hepatitis Viral Chronicles and particularly contemplate access to specialized and multidisciplinary care, diagnostic studies, control and treatment, access to last generation treatments, as well as social and labor rights of people who we live with chronic hepatitis are guaranteed, considering the gratuitousness of these measures to improve care and people quality life. Hepatitis C Rapid Test – The use of rapid tests for the diagnosis of hepatitis C are urgently warranted, since it is a contrasted tool, already used in many countries to achieve early diagnosis in larger population. The containment before the positive result to an infection with hepatitis B or hepatitis C. This result must be provided in a suitable context of emotional restraint, offering care suggestions clearly necessary to follow and should ascertain the rights of the individual ill. It should also provide training to health professionals about appropriate language to explain the situation of illness of the person concerned and caring environment. Access to the best and most appropriate medication is guaranteed: Given the significant new offer of different treatments for chronic viral hepatitis and allow customizing them, we request that access to the best and most suitable medication to ensure free for each person according to what has been indicated by the team of professionals who assist and consent of the sick person. Be privileged the life of the person, regardless of economic costs, administrative bureaucracy, optimizing the time of application for prescribers with drug delivery, either in Obras Sociales, Prepagas (Public Social Health systems) and programs of national and provincial health systems. End the stigma and discrimination that suffer the people affected by these diseases, social and especially labor. We request that state agencies defending the rights of people, analyze this situation to the urgent search for solutions. End the inequity existing distance where in the cases of people to be served away from specialized health centers. Promote public health facilities by province with trained professionals to meet people with chronic hepatitis. Social assistance due to the sick person and his family who have to move or have other needs that obstruct or impede proper care is guaranteed. Massive and permanent public campaigns: intensify the information and prevention campaigns about hepatitis B and hepatitis C, fulfilling the duty to inform all citizens about the existence of these diseases for possible prevention. (7). Either national, provincial or municipal level. Health personnel training. That is to train health professionals across the country, to detect hepatitis B and C in people who have illnesses that may be associated with consequences of infection with hepatitis B or hepatitis C. eg, cirrhosis, diabetes, fatty liver, liver cancer. Especially community health, primary care, specialists in gynecology, gastroenterology, pediatrics and medical clinic, among others, so professionals receiving people for health regularly controls. Health education. Generate appropriate content and updated on Viral Hepatitis for primary and secondary schools, tertiary and technical programs and careers related to health across the country. Content for both students and teachers, reviewing existing information in manuals and notes, which often confused about the actual transmission pathways and care to avoid it, thus producing more ignorance, danger of contact with HBV virus and HCV, and greater discrimination. Promote compliance with the National Program for Comprehensive Sexuality Education. Promote the application in all provinces of the Law 26,159 on the National Programme for Comprehensive Sexuality Education, which is informed and trained teachers, students and parents about the importance of knowing different hepatitis differences in order to prevent the hepatitis B disease, prevention and protection through vaccination.